Recently I wrote about my first experiences with the Beretta 1301 Tactical shotgun. I love the "shotgun carbine" idea of a short, light and handy defensive shotgun. What I didn't get into before was the idea that if you ever had to use a defensive shotgun, it would probably be in the middle of the night, meaning in the dark. I decided to take a shot at gearing up the Beretta 1301 for night time use and testing it in dark conditions. 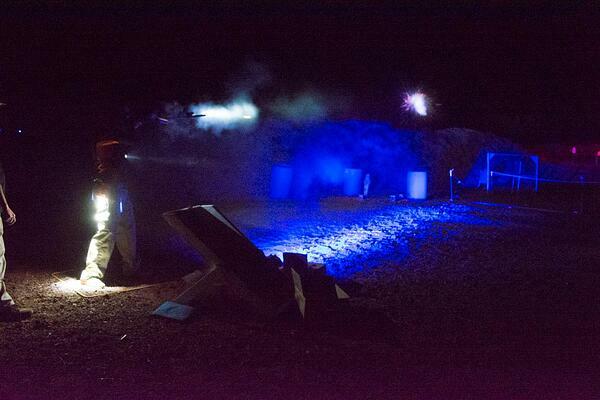 The perfect opportunity was the recent Crimson Trace Midnight 3 Gun Invitational competition. If you're not familiar, it's a three gun event with one important twist of the rules. The competition takes places in the middle of the desert outside of Bend, Oregon, but the shooting doesn't start until after 9pm. If you haven't been in the middle of the high desert in the middle of the night recently, I can tell you, it's dark. Really dark. No residual light from nearby towns. No street lights. Heck, the range doesn't even have electricity or running water. When the International Space Station passes overhead, they have to pause the match because of the glare. Anyway, in preparation for my midnight rendezvous, I added some goodies to the Beretta 1301. First, I called the nice folks at Crimson Trace and politely explained to them that since I was risking life and limb to compete in this match, they should loan me a light or laser for the shotgun. They sent a Rail Master Pro, which offers both 100 lumen light and a red laser that activates with a simple paddle switch. You can configure the light and laser to operate in different modes - a strobe light, for example, but set mine up so that movement of the paddle would turn on both light and laser until i hit the paddle again to turn them off. I mounted this on the barrel with a Nordic Components barrel clamp with rail so that I could reach it with my support hand. As I’m right-handed, I put it on the right side of the barrel, so it’s out of the way of my support hand grip, but easily accessible with my support hand fingers when I want to flip it on. Next, I called Kristi at Aimpoint. Like my Aimpoint PRO, Kristi has never let me down when it comes to good advice about optics. She loaned me an Aimpoint Micro H-1 optic. I guessed that it would line up perfectly with the iron sights on the. Beretta 1301 and it did. I could see the iron sights through the bottom half of the Aimpoint Micro. If my optic ever failed, then I would have a backup option of using the iron sights. This seemed like a good idea until Kristi reminded me that the whole deal about Aimpoint optics is that the batteries run 75% of forever. In this case, you can leave the Micro on for about 5 years non-stop. I figured I could remember to change batteries every couple of years or so to avoid any risk of downtime. Now, when I turn out the lights, I have a compact shotgun with a forward-looking tactical light and I see two red dots out yonder - one from the laser and the other from the Aimpoint. For ammo, the choice was easy. I needed something reliable with shot size with a dense enough pattern to break stationary and flying clays at high speed, but with enough "oomph" to knock down steel targets with one shot. I chose Federal Premium Gold Medal Target loads with 7 1/2 shot. I wasn’t sure which sighting method my eyes would gravitate to, and whether natural sighting methods would vary between still and moving targets. The 3 Gun course at the Crimson Trace had several types of shotgun targets - some optional, like steel plates and others, like stationary and flying clays, where shotgun use was required. Rather than try to plan, I decided to let my eyes and brain tell me which sighting method to use. While my Crimson Trace Rail Master Pro light and laser were always on, I found my eyes on the better lit stages finding the target with less reliance on the weapon light, so the red dot sighting method was feasible. I found my choice varied with ambient light. Some stages had scattered background colored lighting, and where there was a reasonable amount of visibility to the target, my eyes tended to find the Aimpoint red dot. The red dot has adjustable intensity and I kept the setting at the mid range level. On darker stages, it was all laser. My eyes followed the Rail Master Pro light beam across the targets and the laser beam was right there. I rarely raised the shotgun to a full and traditional mount position because I just didn’t need to. I tended to carry it a bit lower so the shotgun didn’t obstruct my vision running through courses and looking for targets. I found I was using the laser even to hit aerial clay targets. Imagine a big shotgun light saber - move the beam to the flying disk and pull the trigger. It was incredibly effective. 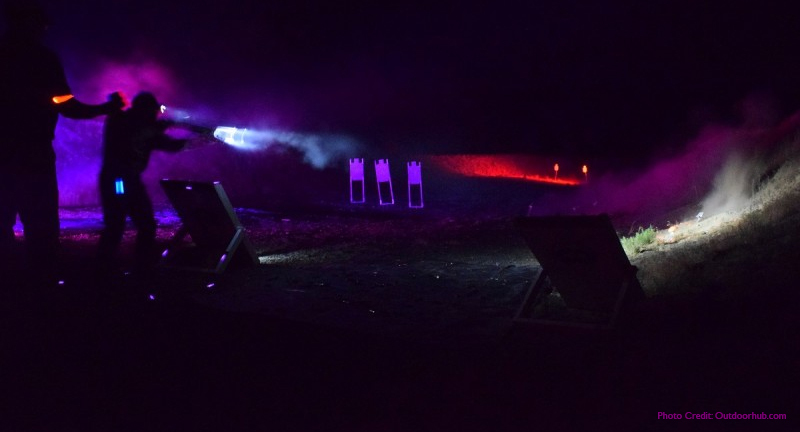 Stage 7 at the Crimson Trace Midnight 3 Gun Invitational had stationary and aerial clay targets. For home defense configuration, I really like the combination of the Aimpoint Micro H1 and side-mounted Rail Master Pro. 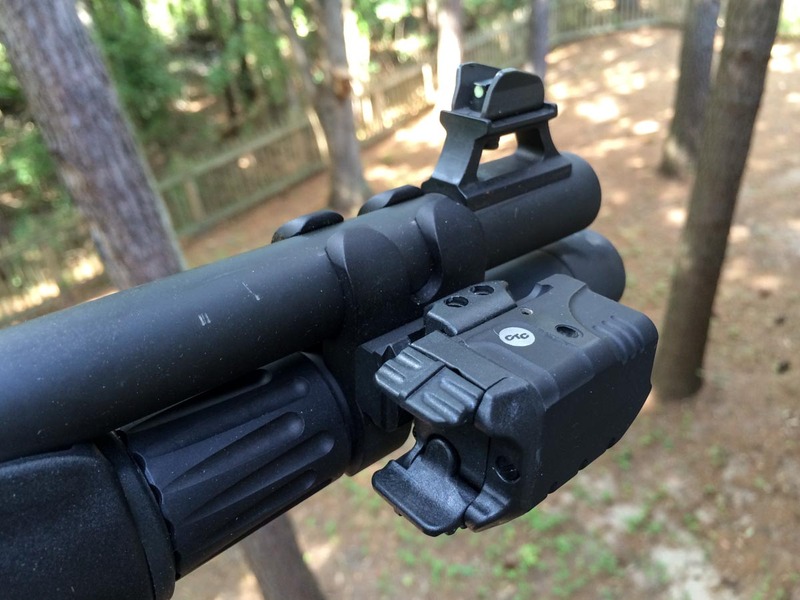 For daylight use, the red dot is ready to go as Aimpoints offer “always on” capability. 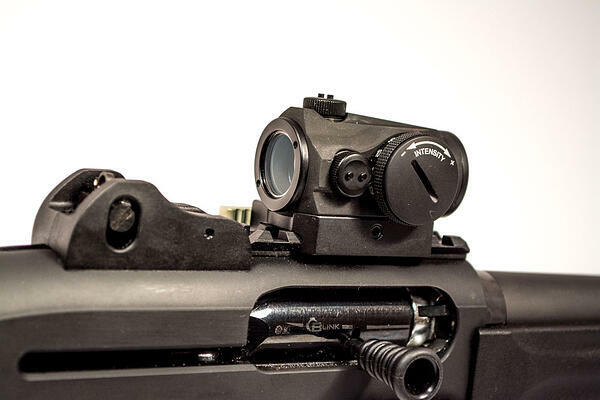 The height of the Aimpoint allows you to see the 1301 Tactical’s iron ghost ring sights through the glass, and the laser is out of the way on the far side of your support hand. For nighttime use, you have a choice. The best part is you don’t really need to make a conscious decision as to which sighting method you will use. They’re both available as circumstances dictate.